Could you shortly describe the history of Frontier Developments? – Frontier Developments was founded in 1994 by David Braben in Cambridge, England and Cambridge is still home today for our team of 400. Until relatively recently we had a long career as a high-profile work-for-hire developer, working with major publishers and platform-holders like Konami, Lucasarts, Sony and Microsoft. In 2013 we went public (listing on the AIM market in London) to support a change of business model to self-publishing. In 2014 we released of our first major self-published title, Elite Dangerous, and since then we’ve published Planet Coaster (2016) and Jurassic World Evolution (2018). We’re continually developing all our existing games as well as looking towards the future with new titles in development. Frontier Developments have been in business for 24 years. Most of these years have been as a work for hire company. How did you realize it was time to pivot and fund your own development and publishing? – It’ll be 25 in January, yes! Frontier has had a long and successful period as a work-for-hire studio, during which we made some fantastic games in partnership with many major companies in the space. However, that period was also characterised as being one whereby the process was very cash-intensive and carried a great deal of risk because of how the market operated. 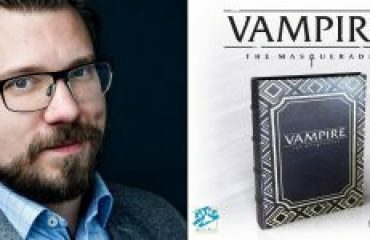 – For example: games were primarily sold in high street retailers requiring a sophisticated distribution network and the production of disks and associated materials. Also, sales were heavily skewed towards the first two weeks following launch as after that the market opened up for pirated copies and second hand games once they had been completed. That meant that only well-established companies with deep pockets could afford to take the risk. – That began to change with the rise of digital distribution. 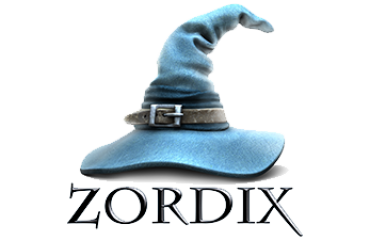 We saw an opportunity whereby companies like ours could use our extensive experience and expertise to develop our own games and distribute them digitally, direct to players. We tested it with LostWinds, which was our first independent game published during our work-for-hire days, and found that we could marry our creativity and development skills with the rigorous process and project management required to develop a high quality game on budget and on time while being disciplined on the additional costs. The success of LostWinds gave us confidence to shift to self-publishing and we’ve never looked back. Since the strategy change, there has been both fully owned IPs and Hollywood IPs in your pipeline of games. What is your strategy going forward? – Our strategy is to consider both our own IP and licensed IP when looking at new opportunities, but our focus is always on ensuring a high-quality game, as ultimately that is the biggest factor for success. Obviously we have a fantastic track record in not only developing our own concepts but then continuing to build on that. If you look at Elite Dangerous, it’s now almost four years since launch and it is testament to the team here that we have continued to add great new content – both paid for and free for all players – on a regular basis. The fact that Elite Dangerous’ fourth year was its most successful financially is a real validation of this strategy. We are pursuing a similar strategy with Planet Coaster. – At the same time, we have a long history of working in partnership with major IP owners, so we were able to collaborate closely with our friends at Universal on Jurassic World Evolution – which we will also continue to support with new content. – We’ll continue to prioritise opportunities where we believe we can make a truly great game that people will enjoy and want to play for many hours. That’s always the most important thing for us. During the summer of 2017, Tencent made a strategic investment in Frontier Developments. After the transaction, 9% of the company belongs to the Chinese giant. Could you elaborate on the partnership and what Tencent brought to the table? – We have built a relationship with Tencent over the last two years, with initial discussions relating to game platform opportunities. Our discussions expanded and in 2017 we were delighted to welcome Tencent as shareholders of the Company. We spoke to some other developers in the industry who had accepted similar investments and they were extremely complementary on the contribution that Tencent had made to their corporate and game development and that really gave us confidence to go ahead. They were absolutely right, and we were pleased when James Mitchell – the CSO of Tencent – accepted our invitation to join our Board. China is a significant market for the industry and is in fact likely to be the largest one in the not too distant future, but it does require some specialist knowledge we felt we were lacking. Having James on board has been really helpful in navigating this. With a number of successful games under your belt, Frontier Developments slowly grows a healthy pile of cash. What are your plans for the net cash position? Dividends? Acquisitions? – We are happy with strategy that we have adopted at Frontier. Our main focus is developing opportunities using a combination of internal and external resources. Our approach to investing in the creation of high quality games supports some of the most talented developers in the industry. We have said in communications for a little while that acquisitions are also an option but not a necessity for our long term plans. 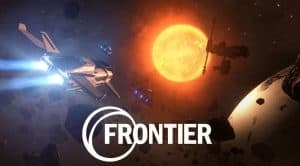 What are Frontier Developments biggest strengths and what are the biggest threats? – Frontier Developments has a long and proud history and it’s something that we are very conscious of maintaining. We spend a lot of time thinking about, and developing, games that are deeply immersive and with attention to detail and player experience at their core. 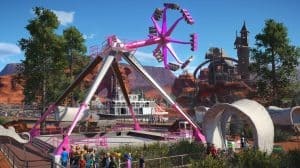 There are 400 billion star systems to visit in Elite Dangerous’ sophisticated simulation of the Milky Way galaxy, and some of the theme park creations that players have constructed in Planet Coaster have been staggering. 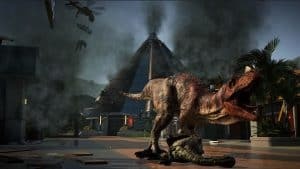 It’s the same in Jurassic World Evolution: everything is as authentic as we could make it, from the behaviour and sounds of the dinosaurs to the look of the classic Jurassic islands. – Authenticity is at the heart of Frontier’s games and we are committed to releasing games that we are 100 percent proud of. Development is supported by our proprietary COBRA game development engine, which is an amazingly powerful tool, but the most important thing is that we are very lucky to have some of the best talent in the industry on our teams, without whom our games would not be possible. – The risks we face are no different from everyone else in the industry. The games market is very fast moving and there is always new technology to support and ideas of what the future might look like. But Frontier’s history is one of adaptability and evolution; as market conditions have changed, so has Frontier. We’re well positioned for the future and looking forward to the opportunities it will bring. Vid publicering äger varken @TaleSpinTrading eller @Pokertrader1 aktier i Frontier Developments.